Martha Jordan is a native of McDowell County. She was raised on the old McCall Family farm in the North Cove section of McDowell County. Her parents were both teachers as was her grandmother. After graduation from North Cove School and the University of North Carolina at Greensboro, she began teaching at Pleasant Gardens Elementary in 1976 and taught there until 2012. She is a member of the McDowell Historical Society, Over Mountain Victory Trail and Greenlee DAR. She is an active volunteer with Special Olympics and serves on the Board of Directors for Foothills Industries. 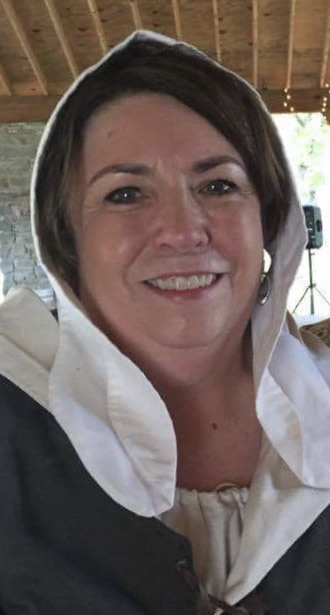 Martha enjoys teaching living history with school children and has organized living history days for nearly every school in McDowell County. Her Revolutionary War ancestors provide many of the historical accounts she uses her programs. These ancestors include: Captain John Connelly, Capt. George Ledbetter, Robert McCall, Johannes Casper Schell, Sr. and Jr., John Childers and Nathaniel Freeman. She serves as Registrar for the Greenlee Chapter DAR and previously served as Regent for 6 years. She also served as State Chairman of the Flag of the United States Committee for DAR. In her spare time she loves to cook, decorate cakes, play with her grandchildren, visit nursing home residents and learn about local history. She has 4 children and 4 grandchildren. In 2009, she married her high school sweetheart after raising her children for the most part as a single mom. Currently, Martha and her husband Ben live in the Lake James area of McDowell County. Martha would like to encourage history lovers of all ages to become members of the Historic Carson House. Membership is a crucial role for keeping our heritage alive. Debbie Queen has worked at the Historic Carson House as the assistant director and a volunteer for seven years. She successfully managed the Carson House as interim executive director in 2016. Debbie has almost completed the Mountain to Sea Trail and enjoys spending time with her four sons and their families and her dog, Lola.